The entire world is in a poor status of quiet, not only because the immigrants crises, but because the unpredictable behavior of Russia and North Korea. From here, Europe is involved in a process of political reshaping. Russia rewrite the borders with Ukraine and Georgia, European Union send messages about the internal reforms (not all of them accepted by the members), and each try to find a new receipt for the security future. USA is in a real turmoil of internal process of reshaping the With House leadership, but it not hesitates to play different roles in the relationship with Europeans countries (not with entire EU). Meantime in the New Europe (as Rumsfeld call it), under US umbrella, we can see different actions taken by Poland, Romania or others, referring to a plan to reshape Europe (not to dissolve EU or NATO), in new strategic initiative. 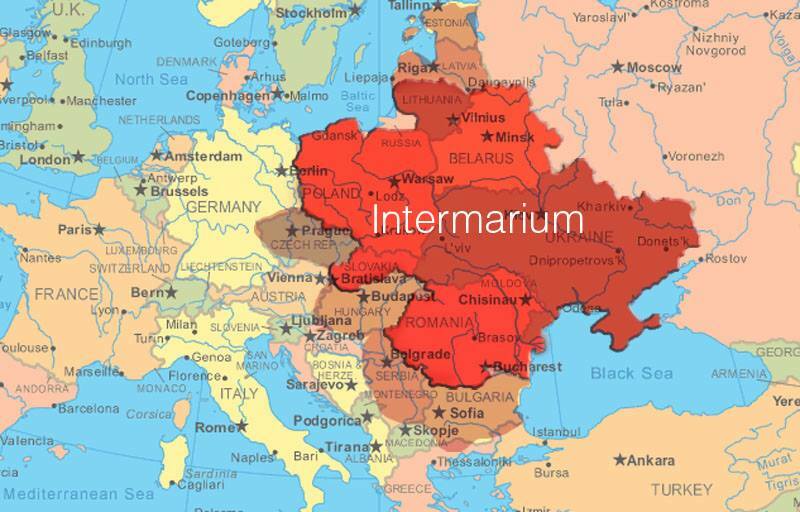 One of these initiatives is Intermarium, an old project which is coming from the beginning of nineteen century. Piłsudski, the former president of Poland, was contemplated a federation or alliance with the Baltic and Balkan states. He had seen a strong relationship betwen a powerfull Poland and a free Ukrainian’ country as a nucelus for a future federation. He took in consideration an union including Poland, Czechoslovakia, Hungary, Scandinavia, the Baltic states, Italy, Romania, Bulgaria, Yugoslavia and Greece. A short analisys shows that Intermarium shoul be an cordon sanitaire (buffer zone), betwen Austro-Hungarian Empire, Russian Empire, and Otoman Emire, having enought power to protect themselve agains each of them. What is important in these equation is the importance of Scandinavian countries, and the role of Greece and Italy (beeing neighborns of Mediteranian Sea). It was a project that never was built, Poland was distrusted by Czechoslovakia and Lithuania, and the only creation was the Little Entante, betwen Romania and Poland. In nowsdays the concept was resurrected by Poland under the US support, and its main objective is to enhance the security of the countries wich have fear of Russia. Today context has huge difference from the previous one, not only because the existence of EU and NATO (as economic union and security alliance ), but because of the different vision of the contries. A short review of the contries strategies will make a picture wich will not bring peace of mind. The artisan of the project is US, which discovered in 2003 (in the second Gulf War), that the ost trustfull contries, and loyal alliats are the Eastern contries (Baltics, Poland and Romania), not only because were helped to join NATO, but because the they hope that america will protect them from Russia treats. Now US, under Trump leadership, is interested to be seen as a protector and an economical and security provider (more than western contries, specially Germany). These game is not one with predictible score, not because eastern country behavior, but because is hard to predict how much financial effort is US ready to make. The recently US Congress decision related with Russia are seen by the EU (specialy Germany), as dangerous for european economy, and are criticizen. These critique will split the opinion in pros and cons, wich is worst for the EU cohesion. The hesitation of EU related with Ukraine future is another argument in favor of US and in the favor of the project, and US use it as an argument for it. Talking about Eastern countries we can see some dificulties in the contruction of real relationship. Ukraine is excluded from the project and in my opinion is one of the worst option, not only because it will be seen as another Georgia, but because Europa and US have not the same strategy for it. Ukraine cannot be play in a poker game only because Putin wants it. Ukraine canoot be split betwen east and west only because some regions (Lugansk and Donets) wants to be a new Russia. These country cannon be let to be a new hotspot in the Europe map, first because creates a favorable enviroment for Russia’s fight for sphere of influence ( and blackmail) and second because historicaly it was taken in consideration as one of the main pillar in the project. Neither Moldavia can be excluded from the project, not because Romania is related (emotional and rational) with it, but because it does not have to many in common with Russia (except coruption). Romania has to persuade all the actors which are involved on the project to be sure that its security border is on Nister river not on the Prut river. To determine Moldova to be involved in this project, Romania have to prouve that all the security and defense efforts and projects that develope are in the same time built for Moldova. It should be difficult to convince all the countries (involved on project) about the importance of Ukraine and Moldova, and will be extremly dificult to convince Hungary that this project is imperious necessary. The dificulty for Hungary is not based on the pepole perception about the necessy of eastern country unity, but is inoculate on the spririt of political decison makers. The Hungarian leadership showed, in a few times, that the realtionship with Romania are not enought trustfull. Hungary did not accepted Romania in the Visegrad group, did not want to subordonate the logistical military cell (NATO Force IntegrationUnit) to Romanian Multinational Division HQ/NATO. Hungary seems to play in a game of north-estearn countries (catolics and reformars) and try to isolate the countries wich are ortodox (as Romania, Moldova and Ukraine). Poland can be a good turnessol sheet in the time that will accept that it status is primus interpares, and will develope a equal status for all the participants. The recent behavior of Poland leadership (authoritarian), manifested in realtion with EU showed that the project could have the same fait with the previous one (Piłsudski).